We are passionate about food and our business and we hope that you’ve managed to capture an essence of what drives us to succeed. The core of our culture is integrity and a devotion to serve nothing but the finest to our customers. 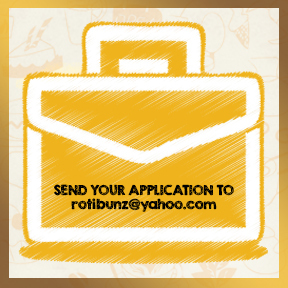 Over the years, Roti Bunz has emerged as a robust contender in a dynamic and fiercely competitive sector. We are an enthusiastic bunch, keen to embrace challenges with an aim to be a leading and world-class brand. With this in mind, we are constantly seeking diligent individuals with the right attitude, strong work ethics, formidable skills and a passion to keep growing and enjoy what we offer. To apply for any suitable positions, kindly upload your CV by clicking on the link to your right, together with all relevant information and experience. We hope to welcome you on board and have you as a vital member of our expanding team.